I just published an e-book called A Meep in Manhattan: 1996 – the bulk of the original content can be seen on this site here: 1996 of my online journal. The e-book is free until Thursday, if I understand how I set this up. I made myself an author page on Amazon, and have been trying out the features. I will likely do my other years as well (I kept it up til when I left grad school in spring 2002), but that’s for myself./posterity. I’m going through these because I want to make some other e-books, and I’d rather try out the e-book creation techniques on content that I created years ago. Because I don’t want to be doing new work. Anyway, check out the book, and let me know what you think of the structure/footnotes/etc. SPRINGFIELD – Gov. Bruce Rauner vetoed a plan Friday that would reduce Chicago’s payments to its police and fire pension funds for each of the next five years, calling it an irresponsible idea that will increase pension debt in the long term. “The cost to Chicago’s taxpayers of kicking this can down the road is truly staggering,” Rauner said in his veto message to lawmakers. He added that actuary estimates show delaying payments for the two pensions will cost a combined $18.6 billion by 2055, when the legislation would require a 90 percent funding level for each. Mayor Rahm Emanuel said after the veto that the Republican governor “just told every Chicago taxpayer to take a hike.” He said Rauner’s action will force a $300 million property tax increase, which he derided as “the Rauner Tax” on Chicago residents. “Decades from now, the Rauner Tax will be this governor’s legacy in Chicago,” Emanuel said in a statement. Uh huh. That’s sweet. Why don’t you go back to practicing your next script. Look, Rahm. These “extra high” payments are to try to fill a hole created by years of underfunding for pensions that people are currently receiving. Chicago can’t cover just their retirees, forget about the people yet to retire. If you guys can’t afford the contributions now, you’re not going to be able to afford it in ten years, or ever. The longer the severe underfunding persists, the more it becomes evident that somebody’s pension is going to be cut. If you can’t start now, you’re never going to start. That’s not Rauner’s fault. These are expensive promises, and you need to fulfill them. It’s pretty clear who is on the right side of this debate. Mayor Emanuel wants to kick the can and Governor Rauner says no. If the Mayor does not want property tax hikes there is an easy solution: “Don’t hike them”. The Mayor already made the largest property tax hike in history, and Chicago citizens get absolutely nothing out of it. Every penny goes to unions. New accounting rules show Chicago Pension Liabilities Jump 168%!. 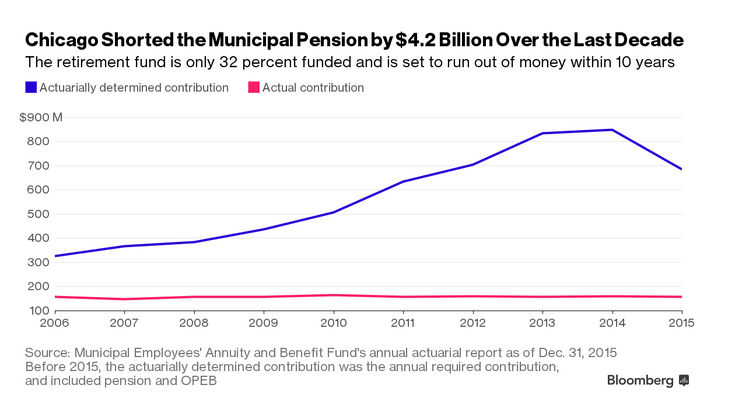 Chicago pensions were understated by $11.5 Billion. The total deficit is now $18.6 billion. Yet the may[or] wants to further reduce contributions! Supposedly the problem will magically fix itself if only given more time and more underfunding! If Mayor Emanuel really wanted to do something for the city and city taxpayers, he would be begging House Speaker Michael Madigan for the one and only thing that can help the city: legislation that would allow Illinois municipal bankruptcies. Let’s stop pretending there is another solution, because there isn’t. I also like this post by Austin Berg of the Illinois Policy Institute running down Mike Madigan. If only we had somebody to do that re: Cuomo. In general, one sees graphs of these pensions only in isolation. Well, let me end that. I’m going to use the official biennial reports from the Department of Insurance. And here’s my underlying spreadsheet. I want to show you two graphs from this data (and don’t worry, there will be more to come in future posts). The total liability pretty steadily marches up ever year, about 12 – 15% between biennal reports, until recently. That recent slowdown was partly due to the “reform” that just got struck down and hasn’t made it into the state biennal report yet. The Teachers total liability is the biggest. Can you see the Laborers’ plan in there? Might you understand why I was underwhelmed with the recent “deal”? That’s the unfunded liability of Chicago’s 6 pension funds. You can really barely see the Laborers fund here. I cut off the vertical scale, so you can’t see the prior years that they were overfunded. But the three largest funds: teachers, police, and municipal workers have all had incredible growth in their unfunded liabilities. Yuck. So fine for the Laborers deal, but it means piddly. See, Rauner is telling Rahm: when the hell were y’all gonna get around to paying for your pensions? Because if you don’t step up, it’s going to deteriorate more rapidly. The funds need higher contributions if they’re ever going to get close to being made whole. Let’s see what the governor had to say. Today I veto Senate Bill 777. This bill continues the irresponsible practice of deferring funding decisions necessary to ensure pension fund solvency well into the future. The bill effectively makes Chicago taxpayers borrow from the pension funds at an additional cost of $18.6 billion. It’s a game politicians like to play with taxpayers’ dollars by delaying payments today and forcing future elected officials to deal with pension funding issues tomorrow. As all know by now, that practice led to our current pension woes across state and local pension systems. Chicago police retirees are rightfully opposed to the bill. Instead of doubling-down on our past mistakes, we must learn from them. In vetoing this bill, I stand with all Chicago taxpayers who will be saddled with higher future pension contributions if the bill were to become law. The cost to Chicago’s taxpayers of kicking this can down the road is truly staggering. Actuaries estimate that between now and 2055, when the law would require these funds to achieve the 90% funded ratio, the total contributions to the Policemen’s Annuity and Benefit Fund of Chicago would increase by approximately $13 billion—an increase of 47.4% over contributions required under the current law. For the Firemen’s Annuity and Benefit Fund of Chicago, the total contributions would increase by approximately $5.6 billion, or 47.1% over the amounts under the current law. In other words, by deferring responsible funding decisions until 2021 and then extending the timeline for reaching responsible funding levels from 2040 to 2055, Chicago is borrowing against its taxpayers to the tune of $18.6 billion. This practice has to stop. If we continue, we’ve learned nothing from our past mistakes. Irresponsible funding decisions have left us with state pension funds that are collectively underfunded to the tune of $111 billion. The poor fiscal health of these pension funds means we have to spend nearly 25 cents out of every dollar of the state budget on pensions, which significantly impairs our ability to provide vital services to those in need. Irresponsible funding decisions have left teachers in Chicago with a drop in pension reserves from 100% funded as recently as 2001 to 51.8% funded today. On that trajectory, teachers can count on receiving only slightly more than 50 cents of every dollar owed to them in retirement – all because of a decade of pension holidays in which Chicago skipped the necessary contributions to the teachers’ pension fund. Irresponsible funding decisions have left two of Chicago’s main employee pension funds near insolvency. The Municipal Employees’ Annuity and Benefit Fund of Chicago and the Laborers’ Annuity and Benefit Fund of Chicago, covering some 79,000 current and former Chicago workers, are projected to have zero balances as early as 2026 and 2029, respectively. This is what happens when you fail to responsibly fund pension obligations. And now, against this historic backdrop, Chicago wants to do it again, this time gambling with the pensions of its police officers and firefighters. SB 777 would permit Chicago to contribute to the two pension funds for its public safety workers far less than is actuarially required during fiscal years 2016 through 2020. Even worse, the bill would allow Chicago an additional 15 years to bring the funds to a responsible funding level of 90%, with the target year shifting from 2040 to 2055. Current and retired police officers and firefighters would have to wait until 2055 to know their pensions are secure. This is bad policy regardless of any fiscal impact, but doubly so when it comes with a price tag of $18.6 billion. Therefore, pursuant to Section 9(b) of Article IV of the Illinois Constitution of 1970, I hereby return Senate Bill 777, entitled “AN ACT concerning public employee benefits”, with the foregoing objections, vetoed in its entirety. That isn’t an official website, but it seems to fit with other sources. And I don’t have anything to add, other than the emphasis I put in there.